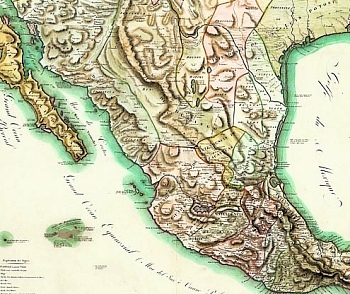 To whom do we owe the birth of modern geography in Mexico? To Alexander von Humboldt, the brilliant early-19th century explorer. His visit to the country in 1803-4 helped him amass sufficient data and ideas to publish works which would prove to be a secure foundation for the development, in particular, of physical geography and meteorology. It is impossible to do justice in these few lines to the brilliance of Friedrich Heinrich Alexander von Humboldt, aptly described by Charles Darwin as “the greatest scientific traveler who ever lived”. He was born in Berlin, Prussia, in 1769 to a very well-connected family. He studied political economy before turning to science at the University of Göttingen in 1789. One of his friends there, Georg Forster, had been scientific illustrator on Captain James Cook’s second voyage. This friendship undoubtedly reinforced Humboldt’s determination to undertake his own long distance travels. Humboldt systematically prepared himself for a life as a scientific explorer, first studying commerce and foreign languages at Hamburg, then geology and mining at Freiberg, followed by anatomy at Jena, as well as astronomy and the use of scientific instruments. Detail from Humboldt's 1811 Map. Humboldt spent five years in the New World, from 1799 to 1804. His visit to Mexico began in Acapulco on March 22, 1803, and lasted until he set sail from Veracruz for the United States on March 7, 1804. In the intervening months, Humboldt measured, recorded, observed and wrote about anything and everything, with remarkable industry and accuracy. He climbed mountains, burned his boots on active volcanoes, descended into mines, recorded geographical coordinates, and collected specimens and antiquities. He also drew a large number of maps, drawings and sketches. Humboldt’s Political essay on the kingdom of New Spain was the first systematic scientific description of the New World. It appeared in 1811, and marked the birth of modern geography in Mexico. His figures and ideas were used and quoted by writers for many many years. On his return to Europe, he spent more than twenty years, mainly in Paris, writing and publishing his results. The crowning glory of Humboldt’s career was his five-volume Kosmos. Begun at age 76, it turned out to be a masterpiece, proposing conceptual generalizations, supported by the observations of the physical world he had made decades earlier. Humboldt’s work was the foundation for the subsequent development of physical geography and meteorology. Developing the concept of isotherms allowed climatic comparisons to be made. He recognized that altitudinal differences in climate echoed latitudinal differences. His essay on the geography of plants related the distribution of plant forms to varying physical conditions. Finding that volcanoes fell naturally into linear groups, Humboldt argued that these presumably corresponded with vast subterranean fissures. In addition, he demonstrated the igneous origin of volcanic rocks for the first time. ﻿Humboldt’s work awakened considerable European interest in the Americas and caused many later artists to travel to Mexico to draw and paint. Humboldt died, at the age of 89, on May 6, 1859. His travels, experiments, and knowledge had transformed western science in the 19th century. Humanist, naturalist, botanist, geographer, geologist: Humboldt was all of these, and more. A brief extract from Humboldt’s “Political Essay on the Kingdom of New Spain” is included in Tony Burton’s “Lake Chapala Through the Ages, an anthology of travellers’ tales” (Sombrero Books 2008). This book has extracts from more than 50 original sources covering the period 1530-1910, together with short biographies of the writers, and an informative commentary setting the extracts in their historical context. Thanks! We hope you’ll continue to find the blog interesting. We are planning short bios in the future of several other geographers who have done pioneering work in Mexico. Did Humboldt ever make it to Santa Fe, New Mexico-a recent find suggests so?